This week has been all about nice bright colours. I admit I am not very fashionable, I do think I have my own sense of what suits me and I try to just stay on the right side of the crazy-rainbow-lady line. I have certainly calmed down from my earlier years. My idea of a great outfit to wear on my first year of university Christmas meal out was a long denim skirt (but as I am tall it only went to mid calf), a bright pink t-shirt, stripy pink knee high socks and original Kickers boots. I LOVED those boots. I have a black patent pair now that I don’t wear very often but they are good in the winter. I also had quite long hair (my hair stayed long until early 2008 when it got chopped and has remained short-ish ever since!) and my idea of styling my long hair was to wear it in pigtails. I had just turned 18, I loved colour, stripes and frogs. I still love all of those things but in a more toned down way. Anyway this week my pink floral Kath Kidston bag was out and about, well to my work and back, it is a lovely spring like bag with useful large pockets that was a present a few years ago. I wore it with a floral Ness skirt from last summer (I got it with a good bit of money off thanks to a promotion they ran when Andy Murray won Wimbledon, thanks to him for that!) a navy t-shirt and heels and a blue cardigan. The rest of the week has been dominated by the colour orange, and variations of the colour orange! Today I have on black trousers and t-shirt and black heels– why all the black? Because my cardigan is a bright orange patterned affair. It is from La Redoute about 8 years ago now, I save it for the first signs of summer then I bring it out. I really like it, but it is bright and bold! Hence the rest of the outfit being boring black. 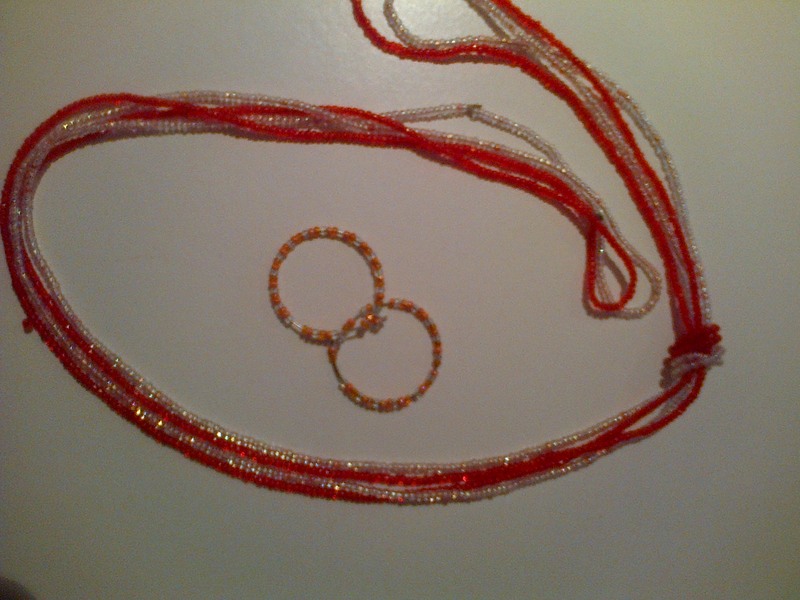 Two simple strings of orange seed beads and little hoops are all I need with this outfit. I certainly won’t be missed in a crowd! 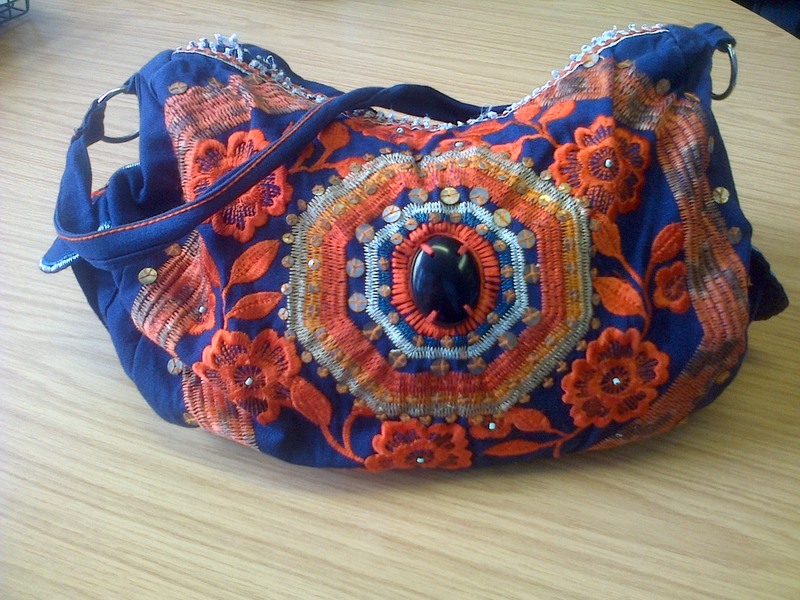 I tend to use this bag when I am wearing orange or coral. It is about 8 years old as well from an Accessorize sale. The only problem I have with it is that the zip opening at the top is quite narrow. Not ideal for work diary, notepad etc., but I usually have another bag with my lunch and other bits and bobs in it on work days which solves that problem. 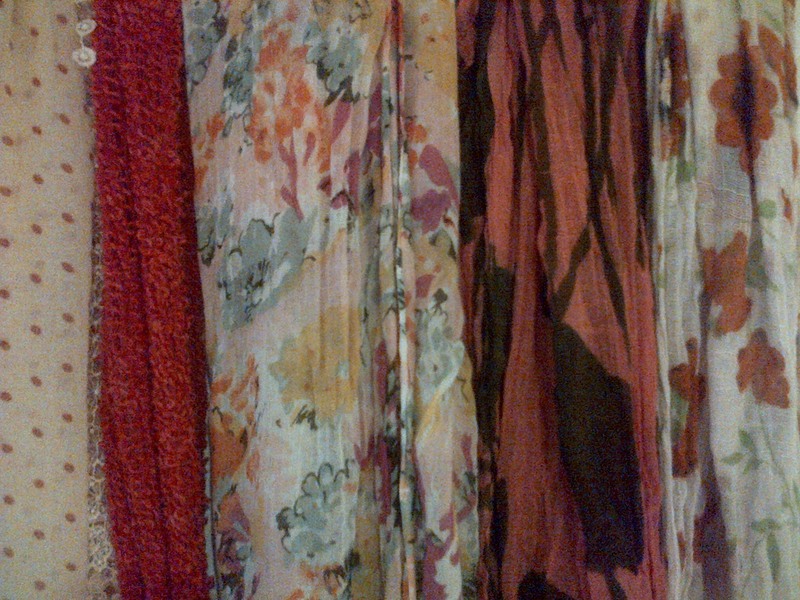 My selection of orange scarves, these are from many varied places, a Hong Kong market, M&Co, with a t-shirt from Next and a couple were gifts from my Mum who shares my little weakness for scarves. 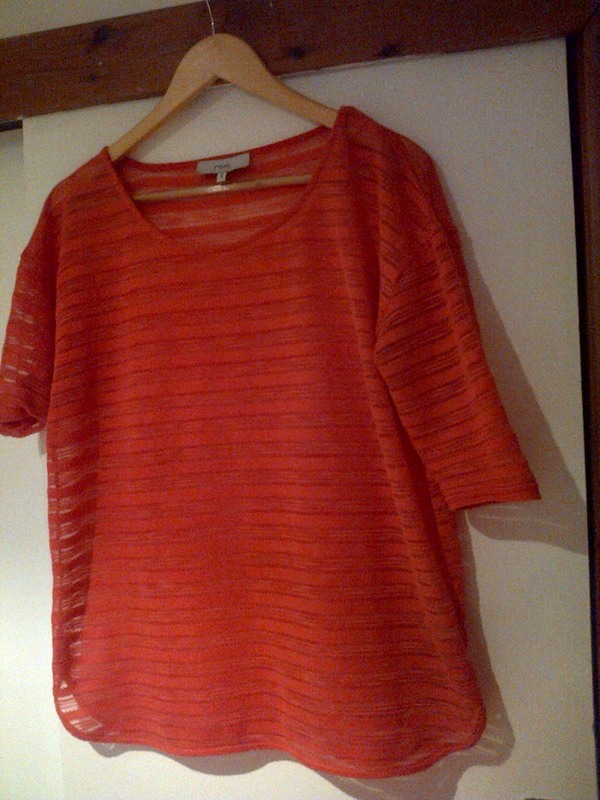 I bought this coral top in Next 2 weeks ago. I mean to keep it for my holiday but I have worn it at least half a dozen times already. For work I’ve been wearing it with a navy vest and blue trousers but on holiday I’ll likely wear it with a white vest and shorts. (32C in Hong Kong just now!) I can’t find this exact top on the Next website but they definitely have it in the shops. I’m sure it was £16 and their vest tops are two for £12 just now. I have a few pretty bits of orange and coral jewellery. 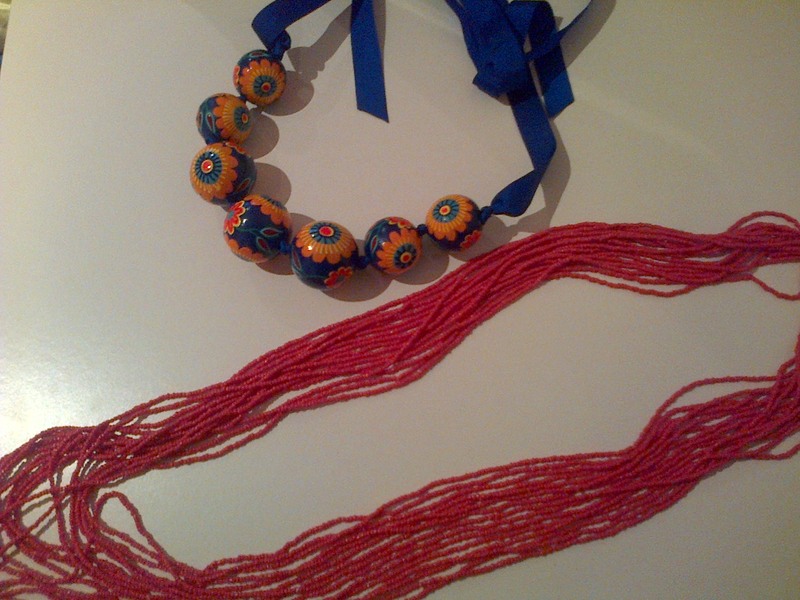 The first is this blue necklace. It really is quite ‘chunky’ for me but very nice and I have never seen anyone else wear it even though I’m sure it was from Accessorize 5-6 years ago. It was a gift from my Mum. Pictured with it is a lovely coral necklace I remember buying in a sale about 3 years ago but I just can’t remember where. I like wearing this one with a t-shirt and my pale grey blazer, it jazzes up the outfit. I don’t wear it for work really as a) it can be ab bit heavy for my neck which gets a bit ache-y anyway sitting at a computer all day, and, b) it gets in my way by sitting on my desk and swishing when I am typing, but when out for summer evening drinks, perfect! 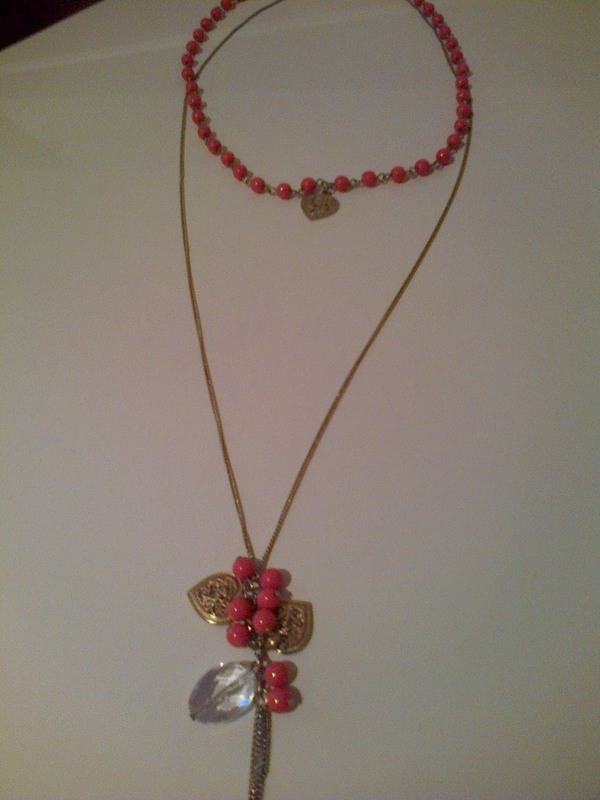 This coral and gold necklace came from Ollie and Nic in 2009. I used to have earring to match (little gold hearts) and a bracelet but both have gone wandering. I’m sure they will turn up eventually. I wear this necklace a lot, I like the double chain the wee touch of gold. I usually wear silver but I like the wee splash of gold for a change. So that is my week so far. I plan to wear a bright green dress tomorrow so things aren’t getting any less bright as the week goes on! I’m off to Glasgow for the day with my Mum on Saturday, a trip to the theatre and a nice restaurant will be involved, not sure what the weather forecast is at the moment. Hopefully nice so I can wear a nice blazer instead of a waterproof coat! 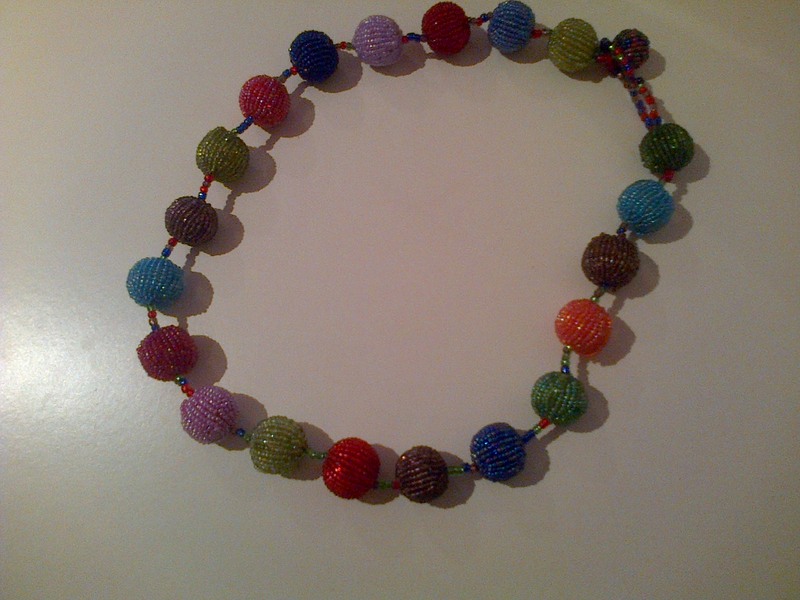 Maybe it will be an outfit that will incorporate this lovely bright necklace that was actually bought on the ferry over to Belfast a few years ago. 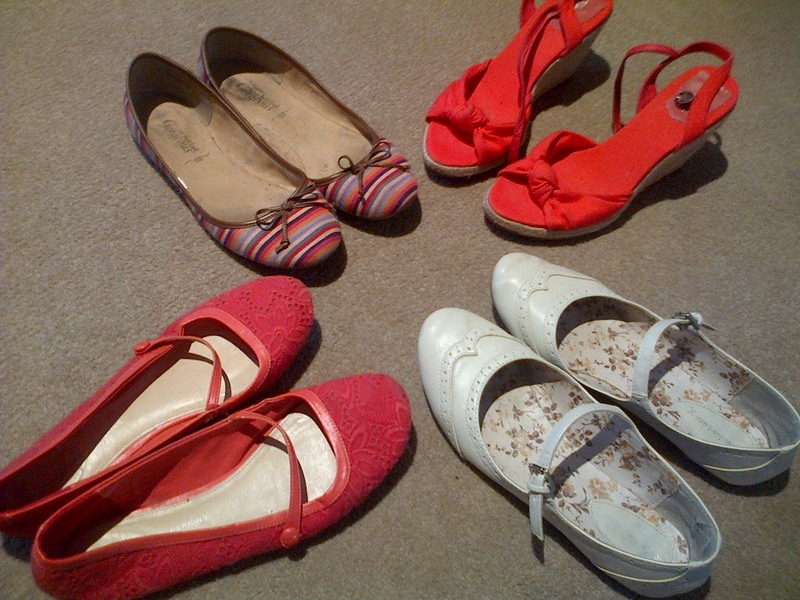 Is everyone else feeling the pull towards bright clothes now we are starting to get (almost) summery weather? 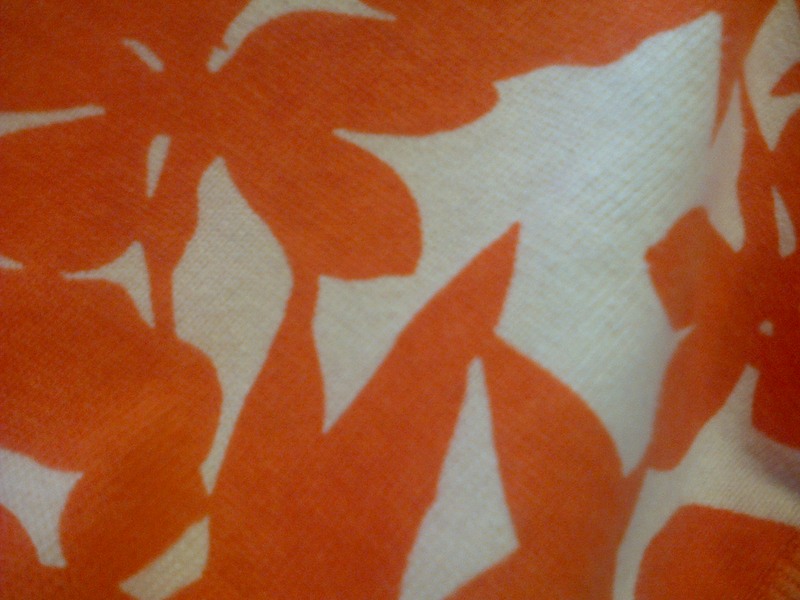 Even on the rainy May days I still feel the tug, maybe I’ll tempt the sun to come out with my all the orange?